Artwork Panel: 32cm x 45cm ≈ 12½" x 17¾"
Silk/Brocade: 41cm x 102.5cm ≈ 16" x 40¼"
This verse comes from the Qu'ran. The text roughly translates as, "...worship your Lord until it comes to you, the certainty (of death)." 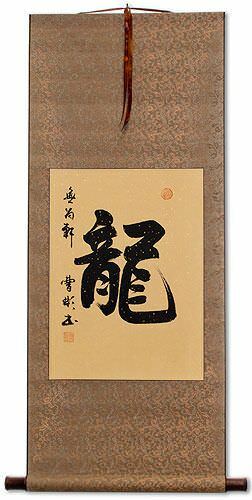 This is printed on handmade paper with a high-fiber content (you will see lots of natural husks and fibers pressed into this paper). The artwork was then mounted to a handmade two-tone silk brocade wall scroll. The result is a beautiful and elegant presentation of this Islamic calligraphy. The print was created on a $4000+ commercial giclee printer. 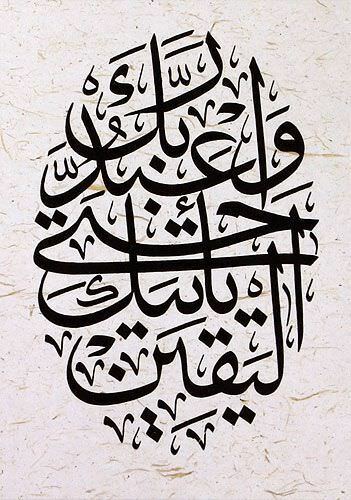 I do not currently have a contact for a calligrapher who can write Arabic script like this by hand. If you are a Thuluth (ثلث ṯuluṯ) calligrapher, please contact me, I would love to be able to offer hand-painted versions of Arabic calligraphy (of course, that will cost more, so prints like this will always be a lot cheaper).